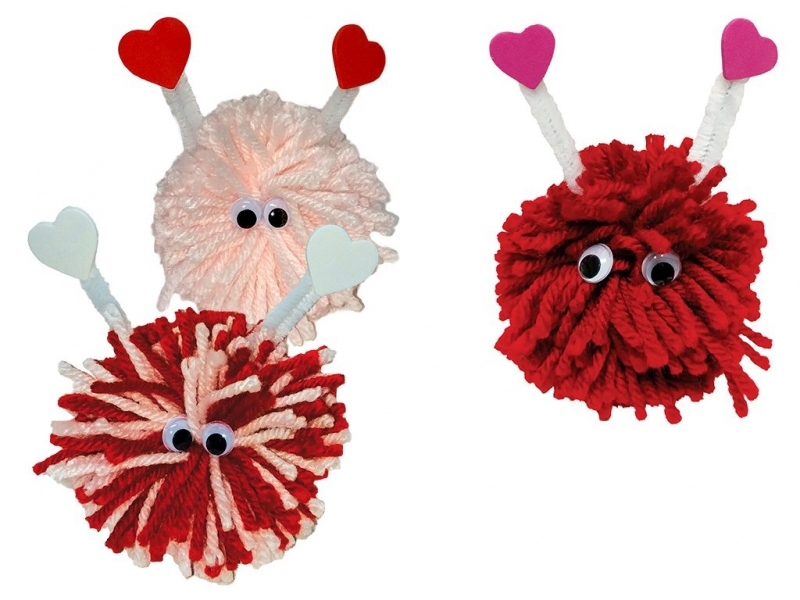 These Little Love Monsters make for great Valentine’s Day gifts. Make several of these little guys and bring them to your child’s Valentine’s Day party. Throw in some variety by making them different sizes and using different colors of yarn. To achieve a two-toned monster, all you have to do is wrap two colors at once and follow the steps as normal. Using a pom pom maker, wrap the yarn around the maker several times. The more yarn used, the better because it will help them to stand on their own. If you don’t have a pom pom maker, simply wrap the yarn around your fingers or around a credit card several times. Slide another piece of yarn through and tie it tightly. Pull your hand or the card out and cut the loop to make your pom pom. Glue two small pipe cleaners to the top of the pom pom for antennae. Press on a foam heart sticker on each antenna. Finally, glue on two googly eyes for the monster’s eyes.